The outward signs of stroke are sometimes obvious, but what happens within? Mike Medberry, long-time conservationist, had the misfortune to examine this issue on a personal level when he was struck down by a stroke while hiking in Craters of the Moon National Monument in Southeastern Idaho, in a desolate, waterless land of lava flows and tunnels in the Snake River Plain. The stroke hit in 2000 as Mike was preparing for a visit by then Secretary of the Interior Bruce Babbitt. A compromise was in the works to expand protection for the Monument to include a preservation area, an effort that Mike had been working on. 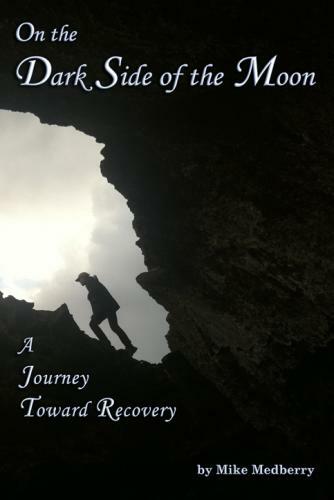 In his book On the Dark Side of the Moon, Mike recounts efforts to rebuild his life post-stroke while at the same time following the progress of the conservation efforts for expansion of the Monument. After his stroke, Mike views himself as a child in an adult’s body, learning once again to do everyday tasks and coordinate his movements. In addition, Mike must learn to speak again and attach the correct words to objects. He felt that his life “…moved in slow motion while the rest of the world zipped around” (31) and he “missed the spark that I felt had defined me” (31). While Mike’s job with the Lands Department was held for him, he finds he has to give it up, being unable to deal with the complex issues and multitasking that the position requires. He finds another less demanding job and starts to write about his recovery and the Craters of the Moon National Monument, in an attempt to rediscover himself and the landscape he cherishes. While the book is primarily about Mike’s recovery from his stroke, we also learn about the history of the Monument’s creation and walk with Mike as he retraces the steps of Robert Limbert, the man responsible for promoting the Monument designation to Congress in 1924. Expansion was deemed important to protect the unique Great Rift area and kipukas, natural land areas surrounded by lava flows, while also ensuring that land already being grazed could remain so. The factors involved in the effort for the Monument’s expansion are examined from political, historical and environmental viewpoints, along with the compromises reached between conservationists, Idaho legislators and recreationalists. Final designation of the Monument and Preserve in 2007 was long and hard-fought, as was Mike’s recovery from stroke. He finds himself drawn repeatedly back to Craters of the Moon, hiking alone as he contemplates the beauty and magnitude of the area. It is his connection and appreciation of the strange beauty of this area that restores his peace and appreciation of living in the present. Instead of the “black vomit” that pioneers recounted when seeing the lava, Mike sees the unbearable beauty, and the extremes of climate and landscape that are an inescapable part of life and shape who he is. This memoir is focused more on the personal struggle and success of Mike Medberry and should not be considered a historical text. It is recommended for those who have suffered through stroke or other major brain injury and their families, and is appropriate for general public library audiences. Cheri Rendler is the Collection Development Librarian for Meridian Library District. A very nice review. Thank you Cheri!